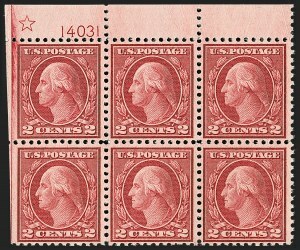 An excellent series of articles on the 5¢ error by Kevin Lowther was published in 2012 in the U.S. Specialist and is available online to members. 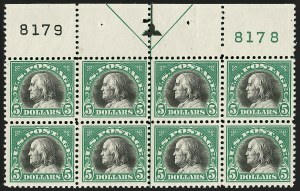 We recommend it to anyone who wants to know more about this fascinating episode of philatelic history--and we recommend this block as an impressive example of the double error in a large multiple. 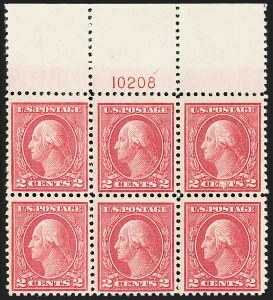 Full top plate blocks of Scott 500 from the experimental Type Ia plate are very rare. 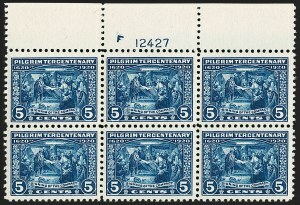 We have offered a couple dozen top plate blocks, as well as complete panes, and nearly all have narrow selvage and are typically off center. 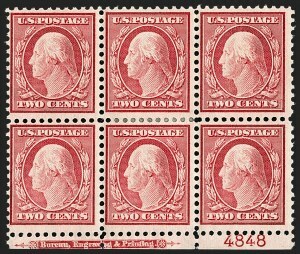 This stamp was created in 1917 when a small excess supply of the imperforate, double-line watermarked Scott 344 was returned by the New York City post office to the BEP for credit. 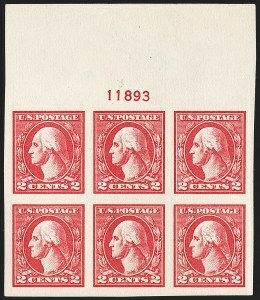 Rather than issue a credit, the BEP perforated the sheets, using the then current Perf 11 gauge and returned them to the New York City post office for sale. 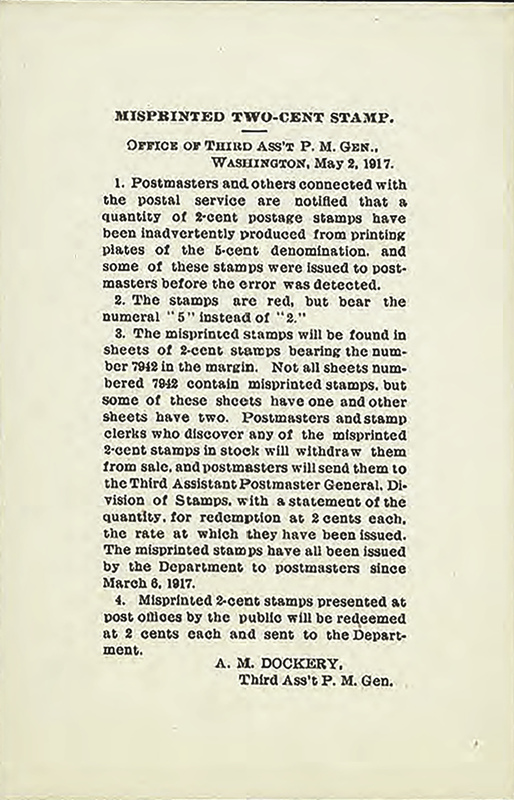 In 1919 a plan was launched to salvage the leading or trailing scraps left over from rotary press printings by turning them into sheet stamps for distribution. 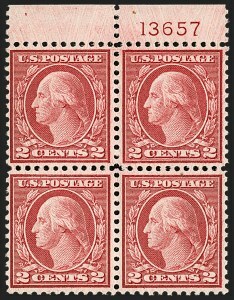 Coil waste was perforated 10 in one direction on the rotary press perforator. 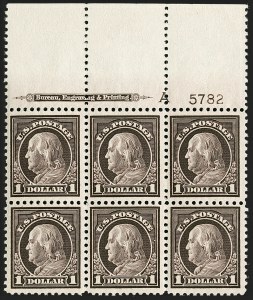 It was then perforated 11 in the other direction, using the line perforator normally used for flat-plate printings, producing Scott 538, 539 and 540. 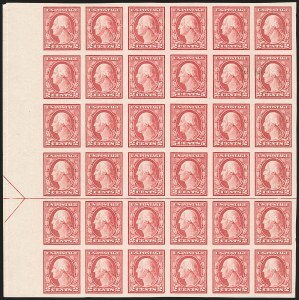 The unfinished horizontally imperforate sheets (Scott Nos. 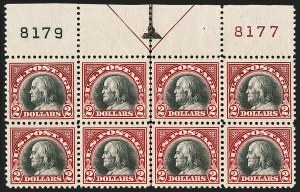 538a and 540a) were acquired by Edward C. Worden, who sold them through J. M. Bartels in 1922. 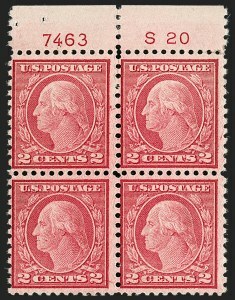 Achieving a precisely perforated product was difficult since coil waste sheets were put through two different perforating machines and the coil waste had a natural tendency to curl. 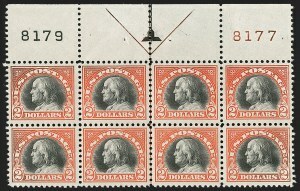 Plate blocks of Scott 539 are very rare and invariably off center. We located four with Power Search, and none of them were centered.